The Volvo V90 is more than just a luxury class wagon. It is a vehicle that has performance features to take you wherever the road may lead. Let’s take a look at what the Volvo V90 has in store. 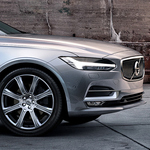 The Volvo V90 has all-wheel-drive with electronic management system that monitors the wheel speed, engine torque, brakes, throttle, and engine speed. Whenever the road becomes slick, the system channels the power to the wheels with the most grip. This helps you stay on the road in the worst weather. Another performance very feature is the electrical power steering personalization feature. You can choose how you want your steering wheel to feel and how much assistance you want it to give you. You can choose from low, medium, and high settings. These are only a few reasons why the Volvo V90 has remained a favorite among those who like to take the less-traveled path.